There are over a dozen shows around the world this weekend.We're highlighting a few below. More details on these, as well as several more fishing and boat shows, can be found on the FirstBoat boat show calendar. Today (Thursday) is the first day of the Colorado RV, Sports, Boat and Travel Show, which calls itself "the largest outdoor recreation show in the region," at the National Western Complex in Denver. There are two other shows starting today in the US - the Northern Illinois Boat Show, which claims to be "Northern Illinois Largest Boat Show," is at the New Lake County Fairgrounds, Grayslake, IL. Also, the Westfield Southlake Mall Boat Show begins today in Merrillville, Indiana.. The Greater Philadelphia Boat Show at the Expo Center in Oaks, PA. 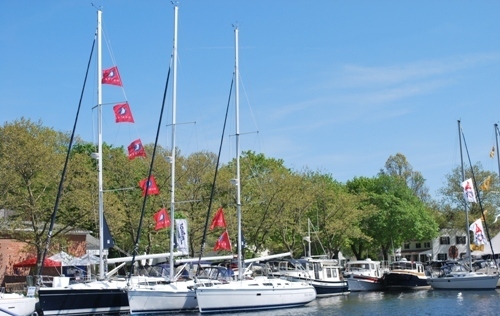 The 10th annual Savannah Boat and Outdoor Show is at the Savannah International Trade and Convention Center. There are also two shows in Florida beginning that run from Friday through Monday - the Tampa Tribune Outdoors Expo and Boat Show at the Florida State Fairgrounds in Tampa, and Water and Wheels 2012 at Cape Harbour in Cape Coral, FL. The Mid-Canada Boat Show (AKA the Winnipeg Boat Show)at the Winnipeg Convention Centre in Manitoba runs Thursday through Sunday. The BC Boat and Sportsmen's Show is happening Friday through Sunday at Tradex in Abbotsford, British Columbia. Also Friday through Sunday is the Niagara Outdoor Sports and Boat Show at the Scotiabank Convention Centre, Niagra Falls, Ontario. On Saturday or Sunday you can check out canoes and kayaks at the Vancouver Outdoor Adventure and Travel Show, which is at the Vancouver Convention Centre in British Columbia. Any More? Let us Know! If we didn't mention a boat show this weekend, please comment on the Daily Boater Facebook page or here on DailyBoater.com. Thanks, and see you at the next show!